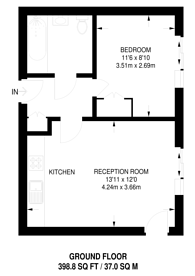 Bright and spacious throughout, this charming one bedroom offers offers a generous living space modern fitted kitchen, a good-sized bedroom and stylish fitted bathroom. Great Indian sweets and savouries. Shopping, cinema and dining all under one roof and with a good selection of restaurants too. 398 (36 Sq M) approx. How is the property market performing in UB6? We have over 1,000 property market reports for locations across London and Surrey - including UB6 and Sudbury.